At present, reigning World Champion Vladimir Prosikhin's Team Nika holds the slenderest of leads going into the final event. The team, on which American Magic helm Dean Barker is calling tactics this season, has been out training long and hard this week. "The days are shorter. It is still very beautiful here, stunning actually," muses Prosikhin; almost as stunning as Team Nika's golden wheels, the RC44 championship's equivalent of a yellow jersey in the Tour de France. "They are nice to touch. A better feeling," agrees Prosikhin. In fact last time Team Nika won the RC44 Championship was in 2015 when she too finished tied on points, after discards, with her compatriots on Bronenosec Sailing Team. 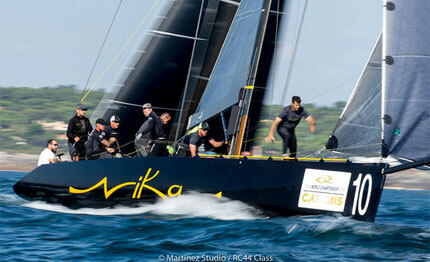 That year the Championship was decided upon Team Nika's better result in the RC44 World Championship. Could the same happen this year? "It does worry me, but we'll just have to do our best. The guys are inspired and they feel good, so I hope it will go well," concludes Prosikhin. Sandwiched behind the Russians by just a point, but in turn ahead of Nico Poons' Charisma by a point, is Igor Lah's Team CEEREF. Lah too is hoping to win the 2018 RC44 Championship, thereby achieving a hat-trick of RC44 Championship wins in this ultra-competitive, owner-driver class. "We will just try to do our best. It think Cascais is brilliant, our best venue," says Lah. "I like Portugese food, I like our event here, I like the Atlantic. And it is warm, not freezing!" A new owner-driver trying out his hand this week in the RC44 class is Paulo Mirpuri, who has taken over the reins of John Bassadone's RC44 this week with Gustavo Martinez Doreste, moving from coaching duties to tactics among the Spanish crew to replace Vasco Vascotto. From Portugal, Mirpuri is an experienced sailor who has sailed everything from Lasers up to a 52m superyacht. He has also had experience sailing a Volvo Ocean 65 and Volvo Open 70, his Mirpuri Foundation having backed the Dee Caffari-skippered Turn the Tide on Plastic entry in the last Volvo Ocean Race. Today was only Mirpuri's second time on board an RC44. "We did some practicing on Monday and it went very well in 12 knots of wind. Today we continued our practicing, so I look forward to seeing what we can do tomorrow. The RC44 is a nice boat to drive, very stable. I don't think it will be too difficult." His Mirpuri Foundation aims to create a better world for future generations, via collaboration between global authorities, companies, communities and individuals, to address positively the most pressing issues threatening the planet. "A sporty boat is a good platform to help bring people closer to the ocean and by doing that they become ambassadors for our causes," explains Mirpuri. Racing gets underway tomorrow and concludes on Sunday. This being mid-November means a mixed bag of weather conditions this week. "It will be a tricky, interesting four days of racing with the wind in the south-east quadrant, ie blowing out of the Lisbon," advises Adrian Stead. "There is also the potential for a depression to pass nearby giving some fairly extreme weather potentially on Saturday." Most exciting for the crew is that southeasterly breeze could come from almost the exact opposite direction to the waves piling in from the Atlantic Ocean. "There is potential for big waves over the weekend," Stead concludes.